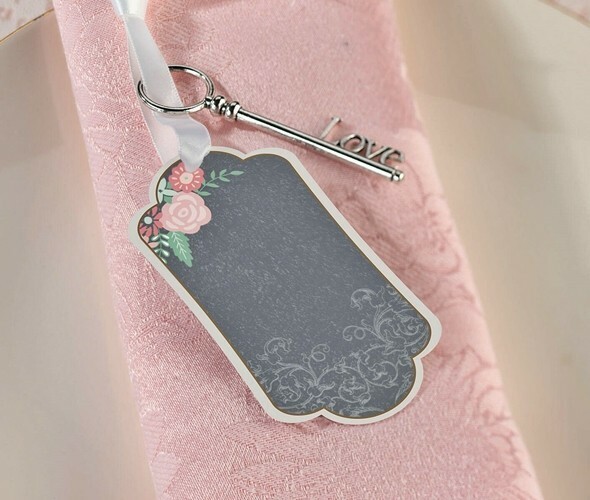 This set of 24 chalkboard and floral motif, frame-shaped key tags is a charming alternative to the traditional guest book as they encourage guest to write down their well wishes for you. They may be displayed on an antiqued tray and collected in a wedding wishes box. PLEASE NOTE: The pictured "Love" key is not included but is available separately as Product Code: LR-GA505LB-A. Sold as a set of 24 and prices quoted below are per set.